Cabo Turbo Technologies has developed a Special ‘NON-SLIP-LOCKNUT’ to secure compressor wheels (impellers) firmly and safely to the threaded end of Shaft & Turbine wheels for all HX80 and HX82/83 models. The problem was (and is), that as a result of very high rotor speeds and extreme centrifugal forces, the compressor wheel could start slipping under the compressor locknut. 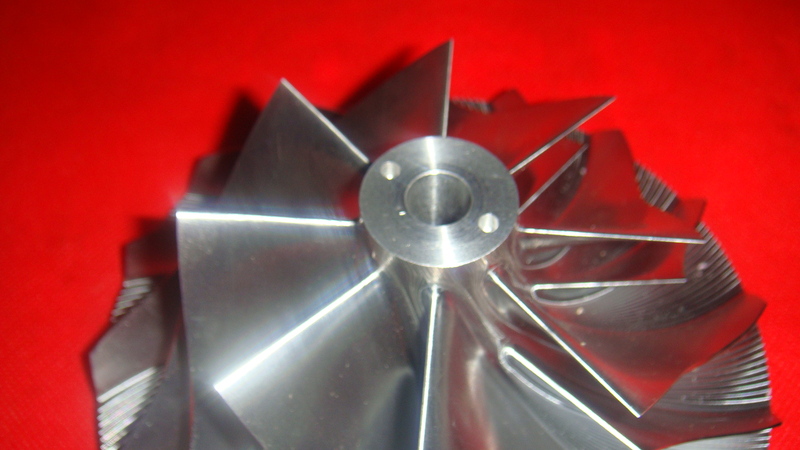 Because of this slipping phenomenon, most of time the locknut was damaging the top nose end of the compressor wheel by making an imprint of wear. However, by the extremely high forces generated, this can also cause damage and make heavy wear imprints onto the backface of the compressor wheel, where it rests on the oil slinger. The clearly softer aluminium material wheel is heavily pressed together between the steel surfaces of both the locknut and oil slinger on the shaft end. 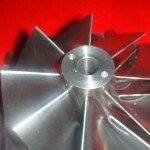 Even to such an extend, that the wheel is deforming and loses its sizing properties. 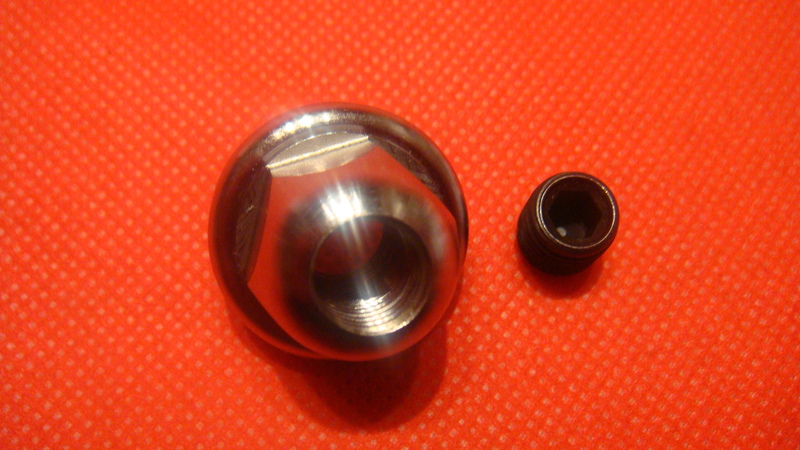 The usual system to avoid slipping, was to fabricate a special locknut, with a larger bottom surface/diameter, furthermore by boring 3 mm holes and fitting two steel connecting pins into the bottom end of the nut (or 3/4 bored-through threaded cap screws in some cases). Furthermore two 3.2 mm holes were bored into the top nose end of the compressor wheel to suit/adapt these pins. In this way a fixed connection was created between the compressor wheel and the locknut. 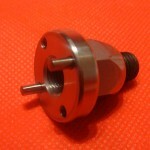 Because the shaft end is M11 x 1 mm Left Hand threaded, once the wheel would slip, it would tighten up the wheel & nut assembly. Common practice then was to ‘weld’ the top end of the locknut to the threaded shaft end, to avoid, that the total assembly could move and tighten up onto the shaft. This system ‘worked’, but…. the severe disadvantage of this ‘welding system’ was, that once one would like to disassemble the rotor and turbocharger for inspection or maintenance, the welding had to be removed by cutting/grinding! In many cases, same time creating the unfortunate result of damaging the threaded end of the shaft & wheel assembly. 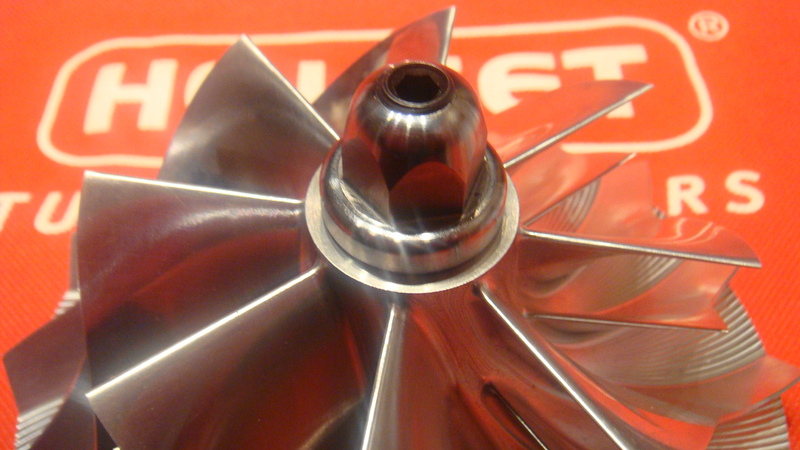 With a bit of bad luck resulting in early and expensive replacement of the total shaft & turbine wheel assembly, which is one of the most expensive parts of a turbo, just because of damaged threads. To eliminate the ‘welding system’ and to avoid unnecessary plus expensive replacements, same time enable ease of disassembling of the turbocharger for inspection/maintenance purposes, we have developed a special locknut. 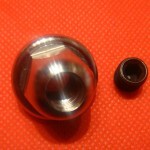 The basics compared to the previous locknut are more or less identical, however, except for the ‘welding’! Rather than fixing the problem with welding, a reverse Right Hand treaded M10 cap screw has been fitted into the top end of the locknut. 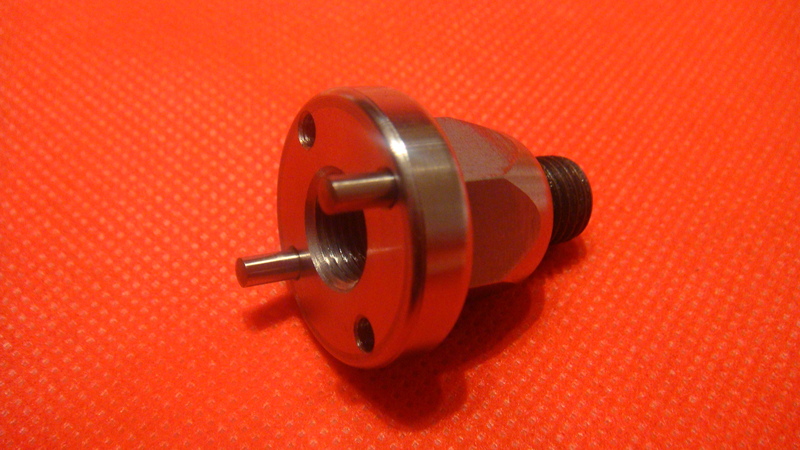 Once the wheel/locknut assembly has been fitted onto the shaft end, one just can tighten the Right Hand cap screw firmly within the locknut, until the bottom face of the cap screw reaches the top end of the shaft. When the wheel/locknut assembly tightens up to the bottom towards the backplate, the shaft end is reaching higher out above the locknut. So once it cannot get higher, because of the locking reverse threaded cap screw in the top of the nut, the total assembly will and cannot move either way…! Just fit it, using and maintaining the standard prescribed torque value (40.7 Nm) for the locknut, as specified by the manufacturer, same torque value for the reverse threaded cap screw. Eliminates and avoids unnecessary and undesired extra tightening of the locknut and the adverse influence of this, such as extra stresses in the compressor portion of the rotor and in particular the negative impact of this on unwanted extra vibrations at high rotor speeds. The special locknut is designed such, that it can accept the slightly different shaft top end lengths within the HX80/82/83 range without any problem. 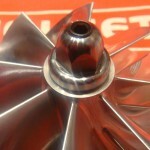 Both for the old- and new style 2.8 mm higher superback compressor wheels.